On Alumni Day, Saturday, February 21st, the University's Office of Stewardship hosted the Princeton Association of New England Scholarship Breakfast at Prospect House. PANE Board President Thomas N. Trkla ’81, was accompanied by fellow board members Bob Ruxin ’76, Ray Benvenuti *81 and Mary Sweeney Koger ’86 S85 P13. Also attending were Tom’s youngest son Jackson, Bob’s daughter Talia, and Mary’s husband, John Koger ’85 S86 P13. The annual scholarship breakfast provided a wonderful opportunity for the PANE board members to meet the current scholarship recipients, learn about their academic and other interests and to share their respective Princeton experiences. The PANE Scholarship was established in 1950 and from then to the present, PANE, working with the University, has provided scholarship funding to Princeton students from the region served by PANE. 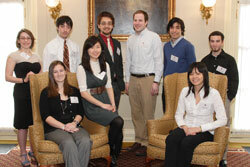 This year, PANE scholarships were awarded to 26 current students. PANE is proud to be able to award scholarships to so many gifted students. This year’s scholarship winners include numerous high school valedictorians and salutatorians, varsity athletes, university orchestra members, student government representatives and community service volunteers. PANE would like to thank Sue Simonelli, Assistant Director of the Office of Stewardship, Paula Hunchar, Director of Regional Development and Jim O’Boyle, Associate Director of Development, for sponsoring the breakfast. We would also like to thank the following scholarship recipients, who braved the cold and sacrificed valuable Saturday morning sleep time to attend the breakfast: Shannyn Gaughan ’12, Maia Ilana Ten Brink ’13, Justin Cahill ‘11, Wyliena Guan ’11, Erin Kim ’14, Nathan Tyrell ’14, Anthony Sacco ’13, Daniel Smith ’13 and Tadesh Inagaki ’14. Ciick here to view a photo album of the event.